On September 6th 2014, I drove to Ballygowan in south-east Galway to visit the place where my Grandfather came from. I had stayed the previous night in O’Sullivan’s Hotel in Gort and got lost a few times even though I had a good map. I arrived in Abbey around 10.30 am, stopped outside the Community Centre and got out to look around. The area was deserted except for a man walking with two small children. I spoke to him and told him I was disorientated and was just trying to get my bearings. “Where is Eagle Hill”? I asked. “About a mile that way” he replied. “Where is Woodford?” “That way!” “And where is Ballygowan?” “A few fields across in that direction”! I told him my Grandfather came from there and I had come to walk the area. He said to call into Holohan’s Pub/Shop on the corner, his father-in-law would be there and he would have a good knowledge of local history. John Holohan was his name. I sought him out and spoke to him. “I’m here to walk the area where my Grandfather came from. He was Patrick McDonagh. He came from Ballygowan but I cannot find any written evidence that he ever lived there. Family history tells us that he did and we have a line from a song ‘Pat McDonagh long under the clay’”. He said he had the song and I should come over to his house and he would give it to me. I couldn’t believe my luck, talk about landing on your feet! We went into his house. His wife Frances was baking scones. He produced a copy of the song for me and came up with five books of local history. I took a picture of them to see if I can get them for myself. We flipped through the pages looking for ‘McDonaghs’ and found a few references to them under the headings ‘Evictions at Ballygowan’. Also I saw that there were ‘Mullens’ living there too. Great Grandmother was Catherine Mullin whose father was Martin. There is a house today in Ballygowan known as Martin Mullens’ house. And his father before him was also Martin. Who knows? Who knows? We can only speculate! After tea and scones we went in my car for a tour of Ballygowan. John was my guide. Leaving Abbey with Holohan’s shop on my right we drove through an area called Abbeyville. Then we came to Ballygowan. A few words here about John Holohan. John is in his late 60s early 70s. He is an auctioneer, valuer and estate agent. A lovely man, deeply interested in local history and people. There is a photo of his pub/shop dated in the early 1900s. He has sold two farms recently in Ballygowan. 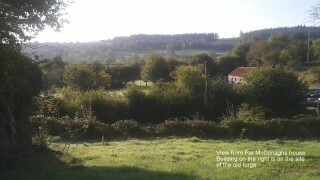 The land in Ballygowan is top class he says and his son recently built a house there. He gave his son a framed copy of the song ‘Sweet Ballygowan’. This is the song that mentions Pat McDonagh. John was just so very generous to me with his time and knowledge. If you read the words of the song you will realise that there is a lot of information in it. The song was written in America by John Kelly. The Kellys were evicted along with their neighbours and they emigrated, but they came back. See last verse. John tells me that with the changes of time the people got their land back and the authorities built houses for them. All the houses were built to the same design. He says the authorities built seven houses of which four are still lived in and three are in ruins. The road to Ballygowan is narrow and twisting, hedges on both sides, gentle hills up and down. House entrances and field gates take you by surprise as you drive along. We travelled the road about half a mile, which I think is about the extent of Ballygowan. We passed the entrance to Finn’s Mill of which I understand only millstones remain. A slurry tank sits proudly on the mills foundations – to the farmer’s delight – such is progress. Heading back to Abbey we moved on to visit Eagle Hill. We met younger members of the family as we arrived, these would be the Burkes, they were driving out. They told us Stanney was in the kitchen. We were made welcome and given seats by the range, fed coffee and cake and started to chat. Stanney was there as were his wife and three girls. I have spoken to Stanney many times on the phone and was pleased to put a face to the voice. He is a cheerful and entertaining character. We spoke about the connection between the McDonaghs and his family. I read Maura’s Family History notes and they were enthralled. Roars of laughter and cheers greeted the bits about Andrew Martin being ‘outside the pale’ and on the side of the Fenians and courting again ‘with undue haste’ after losing Bridget. I said that this must be the fire that Bridget fell into and one of the girls said that she made it to the yard and died out there. I could sense that it was a sad moment for the girls and I pointed out that if events had not unfolded as they did they might not be here today. A hilarious moment then developed with the girls trying to get John to sing ‘Sweet Ballygowan’ – ‘Go on John, go on – we’ll start you off’. John declined though he does know the air. One of the girls, training to be a solicitor, said she would see if she could trace land sales in Ballygowan to see if the actual land could be identified. Kelly’s house in Ballygowan has never been extended and was occupied up to five years ago, when the last of them died – an elderly lady that had great local knowledge, so they say. We said our goodbyes at Eagle Hill with firm handshakes all around and I drove John home. Then I went back to Ballygowan to walk it on my own, spoke to people there and took some photos. Please bear in mind that things stated here may or may not be true. People tell you what they believe to be true. Don’t take this to be gospel. Check it for yourself. Celebrating a wonderful day! Hi Frances, I have done a lot of research on the McDonaghs. A lot of information was supplied by Julie Roche, above and beyond what I hoped. I learned a lot. I have a warm feeling of great gratitude to the people of Ballygowan and Abbey. I kept my family up to date as I went exploring our past. Their response was to keep asking for more information. They were enthralled. Emails went around the world. We can never thank John enough for opening the door for us to view our family history. When I was there with John on that Monday in September he showed me the ruins of the McDonagh house. I took some pictures of the ruins and sent them with my emails to my family. My cousin, Anthony, in Canada, had his doubts about the ruins as being the ruins of the McDonagh house. Anthony drove his parents to Ballygowan in 1960. His mother was a “McDonagh”, as was mine. He is an architect by profession. 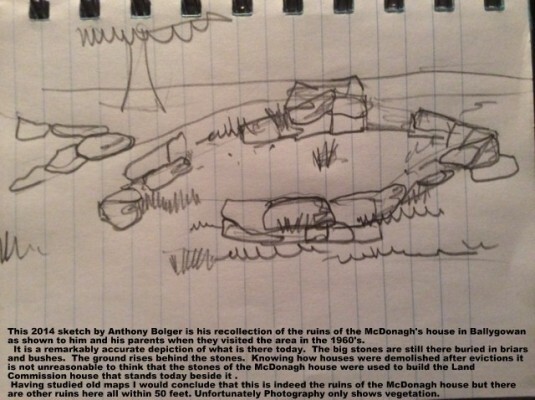 I asked Anthony to draw a sketch of what he was shown as being the ruins of the McDonagh house and he sent it to me. On the day that I returned the local history books that John had kindly loaned to me, I called back down to see the ruins and I was astounded to see how accurate Anthony’s sketch was for something he had seen over 50 years ago. 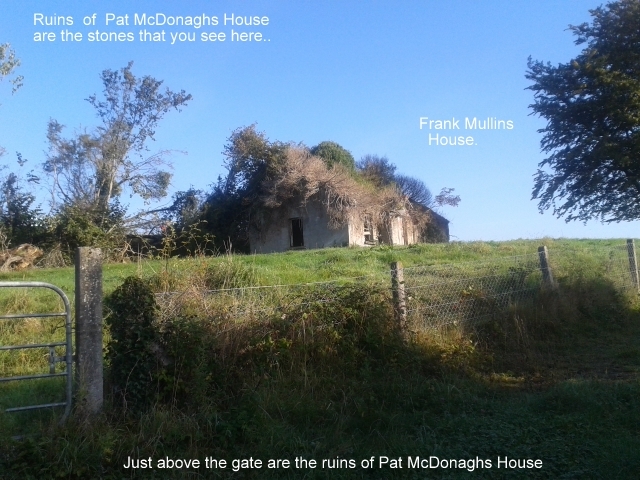 I understand that the people in the house (Frank Mullin’s house) showed him the boulders and stones at the side of the house and said that that was the ruins of the McDonagh house. I took more pictures on that day but the boulders and stones are hidden in grass and vegetation and are not easily seen, but they are there. Reading the books about the evictions and how houses were demolished after evictions it gave me a great warm feeling to think that this is where my grandfather had grown up. There is a great story there. 1880 – Pat McDonagh and his wife Catherine Mullins and their 4 children, three boys and a girl. 1890 – Eviction. The girl was just 17 years old. One of the boys, my grandfather was 21. 1894 and the girl, Bridget, married Andrew Martin and moved into his house, Eagle Hill. 1901 census shows Pat McDonagh 69 years old in a mud-walled thatched cottage in Abbey with his granddaughter Maud Martin. He died in Eagle Hill, aged 72. It is wonderful to know that they looked after him. Unfortunately it was to be 1910 before a political settlement came, 20 years after the evictions. Too late for Pat McDonagh. He died in 1903. His daughter died soon after and the boys went to Boston, Australia, and my grandfather to Dublin where he was surprisingly well off working as a cabinet maker. My mother never spoke about the evictions. It was as if she didn’t know. She said her grandfather had a farm in Galway, never saying that they were tenants. Life is strange. Give my best regards to John and make sure he reads this. This page was added on 10/01/2015. A great thank you to my cousin John for all of his enquiry to date into our family history. I hope to see everything one day. A big thanks to the community heritage project which allows everyone including reluctant exiles to be part of the homeland today.